In contrast to most Greek sites, Olympia is green and lush, amidst groves of trees. Here was the great Sanctuary of Zeus, the Altis, and the setting for the Olympic Games. For over a thousand years, in peace and war, the Greeks assembled here to celebrate this great festival. The simple crown of wild olive was sufficient to immortalize the victor, his family, and his city. 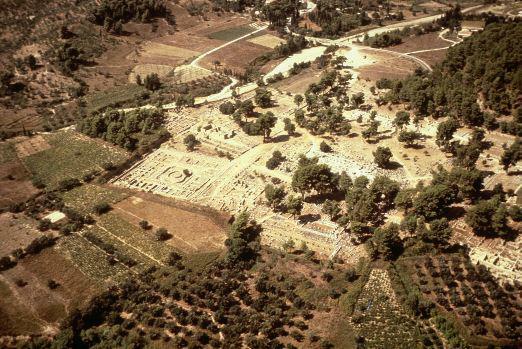 The Greeks referred to the Sanctuary of Zeus as the Altis. The name Altis came from a corruption of the Elean word for grove, alsos . Sanctuaries were centers of religious worship where the Greeks built temples, treasuries, altars, statues, and other structures. The crowns made of olive leaves came from a wild olive tree in the Altis, which was called the olive of the Beautiful Crown. Olive trees, which supplied the Greeks with olive oil, olives, a cleaning agent for bathing, and a base for perfumes, were an important resource in the rocky and dry Greek environment. A Greek legend credited the hero Herakles (Hercules) with introducing the olive tree to Greece.